Nearly all roofs are framed using one of two methods: either the standard “stick” framing or newer “truss” framing style. Truss-framed roofs are built from triangular-shaped, pre-made truss units. The stick-framed roofs, on the other hand, use individual rafters that span from the top of exterior walls to the ridge. The roof trusses are used to frame the roof. Trusses are pre-made, triangulated wooden structures used to support the roof. In many cases, the dimensions of the roof can be input into a computer and the computer program will dictate the sizes and spaces of the various parts of the roof should be, including the trusses. A truss is one contiguous double rafter and ceiling joist unit. Truss construction is just as strong as the stick frame method, but is lighter weight and uses smaller sizes of lumber. Gable and hip roofs are built primarily of trusses. Like wall studs and floor joists, rafters and trusses are spaced about 16 or 24 inches from center to center. Most roofs use 16-inch spacings for strength and rigidity. The rafters are usually positioned directly above the wall studs. Since trusses are carefully engineered units that shouldn’t be cut, they are not a good choice for roofs that could be modified at a later date. Because they have several intermediate support members, they also don’t allow for the proper use of the attic space. Roofs with dormers or on houses with cathedral ceilings, attic rooms, or attic storage areas, are usually stick built. 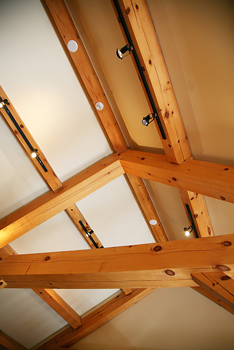 Stick framing creates a triangle between the rafters and ceiling joists. A collar beam adds strength in the middle. The builder will usually figure what the load must be, which determines the positioning and spacing of the beams. Baffles are placed in the roof area when utilizing the stick building method to provide proper ventilation for the attic. This prevents the attic from becoming too hot and also prevents trapped moisture from causing rot and decay. It is important to make sure that whatever style of roof you choose is installed properly so the house can be well-supported and ventilated. Proper installation will also prevent any problems with the dry wall being level once you install it. With the right planning and know how, building a roof that withstands the many demands that is placed on it is possible. Thank you for educating people on how important having sturdy and long lasting roof is. People tend to take for granted their roofs; and as a result, they encounter a lot of recurring problems. I have done extensive repairs on my roof as well. And with the help of my colleagues, we strengthened and even insulated my roof against the snowy weather.